British visual artist, Rachel Wilberforce, is pleased to announce a landmark contemporary public realm artwork for Southwark: Cyclorama. 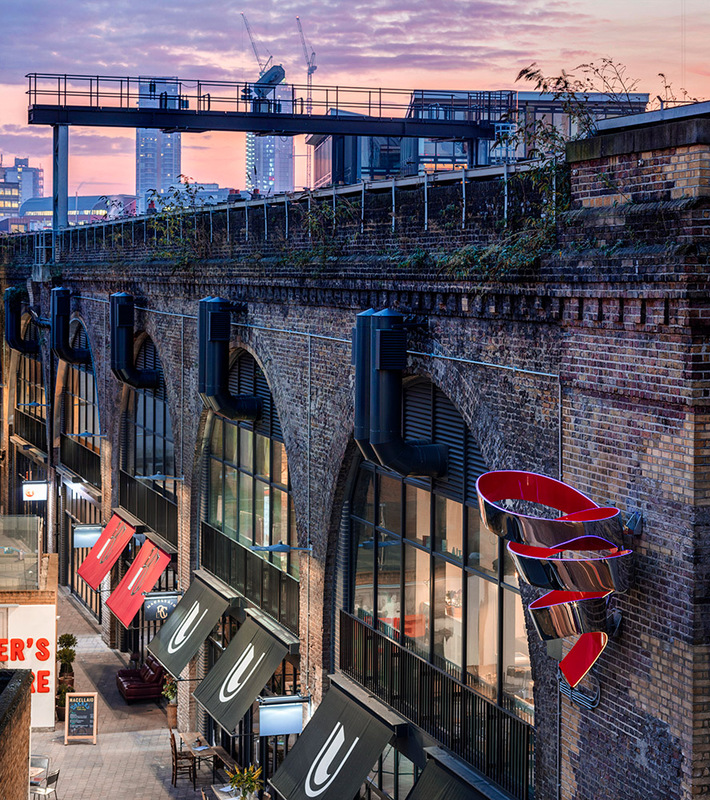 Establishing Bankside as the emerging art hub of London – a reputation galvanised by the Tate Modern regeneration – this new addition to London’s Bankside marks the entrance to Union Yard and can be viewed from Union and Great Suffolk Street, SE1. Cyclorama forms part of a project to regenerate the local area and create an exciting new destination for local communities. 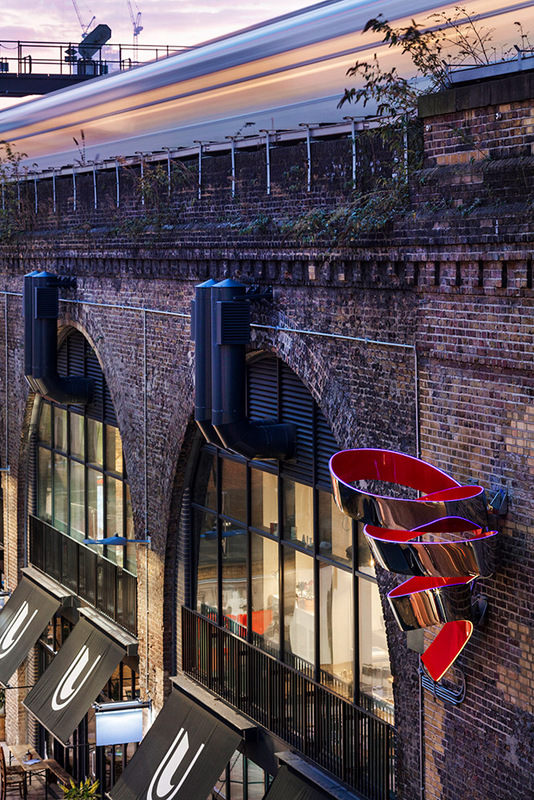 The sculpture has been commissioned by Network Rail, as part of a wider collaboration with Southwark Council and Better Bankside, to secure funds for public realm infrastructure in the area. Cyclorama is situated above the renowned Union Theatre on the viaduct and takes its name from the term used to describe the lit back wall or curtain often used to depict the sky in theatrical productions. Celebrating the heritage of the theatre as well as the history of the fashion and textile industries in the local area, Cyclorama explores aspects of the ‘performative’, of ‘spectacle’ and ‘stage’ as well as referencing ‘movement’ and ‘journey’ as signified by the operational railway viaduct on which it sits. The name ‘Union Street’ itself lends the idea of a confluence of identities and uses, a coming together of different superimposed histories, purposes and meanings. The elegant dynamic spiral is made of stainless steel, mirror polished on one side and spray painted a vibrant red on the other. Side-emitting fibre optic lighting glows along each curve. Cyclorama’s highly mirrored outer surface reveals the miniature reflections of the neighbouring buildings, juxtaposing the solid brick face of the viaduct with the ever-changing skyline of this vigorous intersection. Artfully emulating the flashes of red on the trains that pass above it as well as the traditional rich red velvet of the theatre curtains below, there is both conformity and chaos - the sculpture itself reflecting the inherent tension between the uncompromising nature of the steel and the determined flow of the aqueous ‘coil’. The fundamental theatricality of the work is further emphasised by a projected colour palette that subtly changes as it moves in mirror-image reverse. Day and night, sunrise and sunset, continuously moving light and colour from two projectors creates a fluid light curvature that smoothly follows the contours of the sculpture working in unison with the fluctuating lighting conditions and surface reflections in a shifting experience and cycle of the artwork and its surroundings.